Busting the Myth around the D-Shackle! Daniel from CIA Victoria busts some common towing myths behind the D-Shackle. When travelling our beautiful country, you need be sure you are safe. 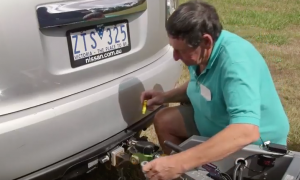 A key way to ensure safety is by connecting your car to your caravan correctly. Daniel explains the D-Shackle is rated to an Australian standard which is for lifting purposes, not pulling. So when you’re selecting the D-Shackle for your caravan there are some guidelines from the State Regulatory Authorities which state they need to be fit for purpose. It’s not a regulation, it’s a guidance! Make sure to check out the guidance table which will help give you the correct measurements that match up to your vehicle. For more information visit the Go Make Some Memories Website!